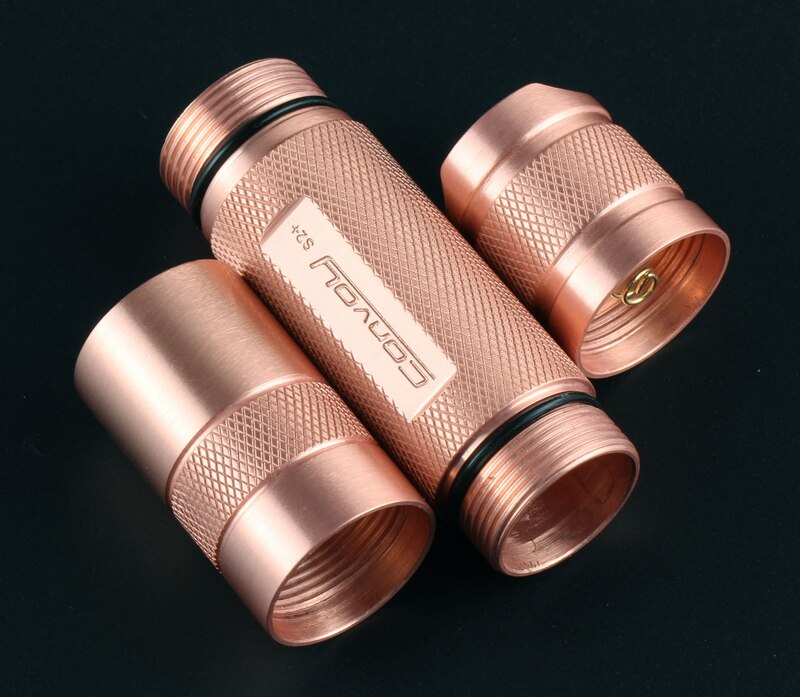 Some of you have heard about or seen pictures of the small batch of pure copper Convoy S2+. There are only about 50 in total so I suggested Simon limit it to 1 or 2 per person so that more BLF members have a chance to own one of these. After talking with Simon if these sell quickly he will have another batch made so that no BLF member has to miss out. These are expensive to produce and Simon is not making much of a profit on these so the standard 15% BLF discount does not apply this time. When purchasing you must specify which emitter you want. The usual XML2 tints and XPL-HI tints available in all of Convoys S2+ lineup is available as well as the old 3/5 driver which can be used with the lighted switch for an extra few dollars. The much better (IMHO) Biscotti driver would be my personal choice but it does not work with the lighted switch. Don’t forget to specify smooth or OP reflector as well. Lots of nice configurations available. Get them while they last! Thanks. Ordered one XPL NW + Biscoti. Nice! That’s exactly what I’m going for. I think the combination of the OP reflector and XPL-HI will give a nice flood/throw balance. I’m going for 7135×8 too. That big chunk of copper will handle the heat much better than its aluminum brethren. Any idea what color switch cover would look good? It’s a raw copper or copper alloy? How heavy is it gonna be? Ordered, but I forgot to include my specs in my order… Maybe Simon would be good enough to make it a host for me. I’ll have to message him. I think this is his second batch. I bought one as a host when he still had some of his previous very limited batch and it was just under $40 shipped. I haven’t received it yet. What is the best way to reach Simon? Is he an active member here or can I only contact him via Aliexpress? I contacted Simon at his Aliexpress store. He said he don’t post on BLF and CPF because it is very difficult for his internet to connect to these sites. Could not find any “comments” or “notes” area’s. Pity. Just message Simon directly on aliexpress. You can go to his store and use the contact seller function. If you already have a completed transaction, just give Simon the sales ID number. During the ordering process there is a small text box below the item list you can use to leave a message to the merchant. I’m fairly certain this is pure 100% copper and not an alloy but I have to confirm. Approximately very…very heavy. In other words, I don’t know but I asked Simon to provide the host weight and will post it here when I know. As SKV89 said it is very difficult for Simon to view or post here due to the firewall in his country. That is why I act as his officially unofficial representative here. Isn’t all this quoting and thanking quite a lot? I don’t always have the time to respond properly but I do as much as I can and I love it. It’s part of what makes BLF such an awesome forum. Kind/helpful/thoughtful people. You are absolutely right. Sorry for jamming the thread with all these quotes. I’m just guessing but its probably a cooper alloy of C145 Tellurium. Easier to machine, longer tool life while machining, stronger, cheaper and close to the same properties as pure cooper. Just a guess though. I'm with vinte77, I would be interested in it as a host and stick an XHP50 emitter inside. Is the pill made from brass or is it made of copper? Pictures show it is brass. That’s mine ordered. More than half sold already! 0K, quick question with regards to the above mentioned lighted tailcap. Related info for the version Simon uses here? Would it work with an H1-A driver? I imagine it will be a decent pocket anchor. It’s gonna be heavy. 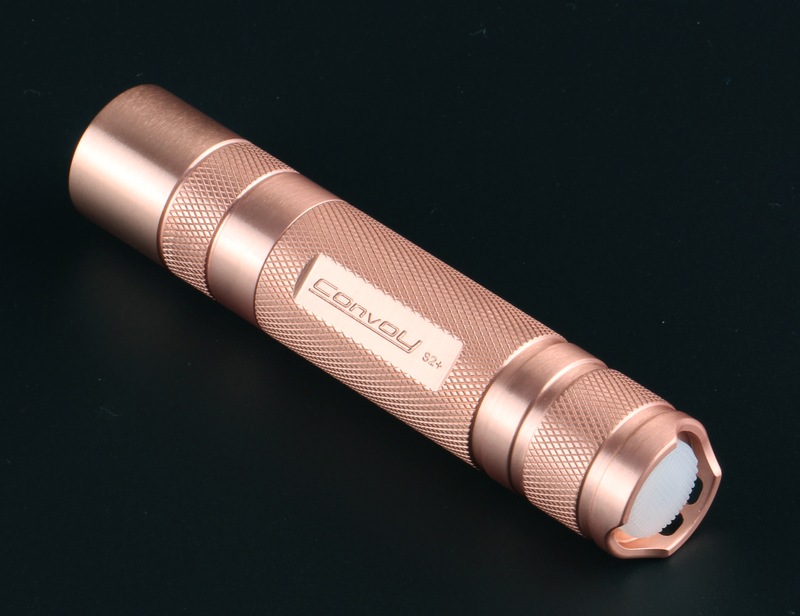 I have copper AA lights that weigh as much if not more so than a aluminum 18650 light. Copper 18650 S2+ I bet will tip the scales at at least 5 kilos. Together with a copper pill from kiriba-ru, this should enable triple emitters to maintain high output for very longer periods. It is pinker than I would think, so some alloy? Sorry if this has been discussed in one of the multiple S2 modding thread, i can’t find a clear answer: is the A6 driver compatible with the S2+ and does the switch need replacement (the A6 driver needs a high amp forward clicky if i’m not mistaken)? Is that with pill and battery?